Really, c’mon now. This is getting ridiculous. And I better not hear anyone in the NBA complain about the second of a back-to-back on the road ever again. In fact, the Bulls’ relentless 93-76 victory over the Atlanta Hawks Saturday could be one of those seminal moments in NBA history, like the first morning shootaround. Playing the second game of a back-to-back on the road, with three starters out including All-Star Joakim Noah and the East’s leader in double-doubles, Carlos Boozer, and coming off a loss in Brooklyn in which new 6-9 center Taj Gibson played all 48 minutes and new 6-8 power forward Luol Deng played 47 minutes and 56 seconds, the Bulls pulled away from Atlanta after halftime with Deng, Gibson and Jimmy Butler, the latter who played a restful 40 minutes Friday, all playing more than 45 minutes and Nate Robinson playing his second straight game of more than 40 minutes. Yet, they were the anchors who steadied the Bulls seemingly decaying crew. Deng had 25 points and 14 rebounds, including two fourth quarters threes that gave the Bulls a 78-64 lead with about six minutes left that effectively ended it. Butler would add another about a minute later. Deng also had five assists, four steals and two blocks. He later drove the bus, taxied the plane out of its gate spot and suggested a lemon scented detergent for washing the uniforms. Gibson playing center for Noah had 19 points and 19 rebounds and three blocks, coming out dunking the ball once again to open the game for the Bulls and outplaying the bigger and more famous Atlanta big men, Josh Smith with 19 points and 13 rebounds and Al Horford with 14 points and 12 rebounds. Butler had 16 points and 10 rebounds, and Robinson after a poor shooting game in Brooklyn had 20 points and eight assists with four threes, including 12 points in the third quarter when the Bulls broke from trailing 44-43 at halftime to a 69-60 lead entering the fourth quarter. 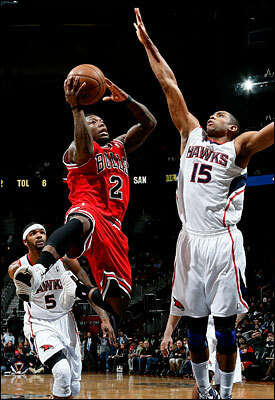 The Bulls moved to 29-18 to hang onto third in the East this week going into the big makeup game in Indiana Monday. So the Bulls, obviously, didn’t want to come in off a pair of road losses and with questions about whether they could win with so many starters out, though Boozer could return Monday. Sure, coach Tom Thibodeau always says the team has enough to win with and everyone’s an NBA player and next man in line and everything runs like a Deere and reach out and touch someone. OK, maybe he doesn’t always say all those things, but they seem to run together at some point. But what else can a coach say? Perhaps other than Nuggets coach Doug Moe to open the 1987 playoffs famously saying, “We’ve got no shot to beat the Lakers (they were swept),” coaches repeat the no excuses mantra, though perhaps not as habitually as Thibodeau. But when you lose games under those circumstances no matter the brave face everyone shows, the doubt has to exist no matter the character and experience. After all, you’re essentially going with a reserve unit you were criticized for bringing in to replace last year’s favored reserve team. And not only do the Bulls win, but on the road and having arrived in Atlanta well after midnight on game day and Nate not having enough time to ride the Magic Mountain roller coaster at Six Flags Georgia. They beat a Hawks team that not only had been off since Wednesday, but which has been a challenger in the Eastern Conference and now is 26-20. We don’t make much of one game during the regular season, unless, of course, the Bulls lose and Thibs played Deng too much and left Nate in too long and what the heck was Boozer doing in there and fire him! But this has to be a devastating loss for the Hawks. OK, you can lose. But not at home by that much and to a team basically using six players (Nazr Mohammed and Marquis Teague combined for about 12 minutes), four of whom are regular reserves. “I think one of our goals was to kind of wear them down,” said Kyle Korver, who was three of five on threes. “They had a couple guys that played a lot of minutes last night. It was a tough back-to-back, but they kind of took it to us. The Bulls just played really solid basketball. There’s nothing super flashy, but they execute well, they play good defense, and they play really hard. It’s a simple observation, but, as usual, astute from Korver. The Bulls don’t overwhelm you with a game that needs a nickname like Showtime, the Big Three, Run TMC or Lob City. The run pick and roll, they cut, roll to the basket, hard screen, ball reversal, again, back across, bounce pass, back cut, attack the board, rebound, and start all over again. Yet, they win the game even with an unusual of late shooting guard flameout as Richard Hamilton and Marco Belinelli combined to shoot four of 22. Which basically means four guys, one of whom idolizes Peter Pan, knocked out a bigger and stronger Hawks team. “You have to give them credit,” said Horford. “They played last night. They came out and just imposed their will the whole game. They dominated both ends. Doesn’t seem right that a team should fake. And then try to take advantage. Somehow doesn’t seem sporting. So Noah is out with plantar fasciitis, Hinrich with an elbow infection and Boozer with a sore hamstring. Who exactly did Horford think was going to play? Erwin Mueller? Wallace Bryant? Heck, Thibodeau did give even Vladimir Radmanovic, who has had some back spasms of late, a brief look. But after that quick start and the Hawks coming back in the slower kind of game the Bulls wanted, it was the Bulls making the big shots with the livelier legs after halftime, holding Atlanta to 33 percent shooting, outrebounding them by 11 and almost doubling them in points in the paint with Deng leading the way with 10 fourth quarter points and four fourth quarter steals and wondering why games are just 48 minutes. Gibson added six rebounds and two blocks in the fourth. It’s what the Bulls do.